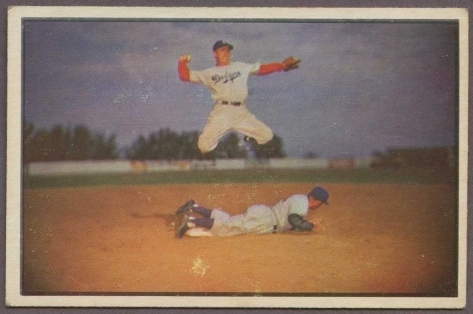 We've written a lot about the 1953 Bowman baseball cards because they are so visually pleasing and include, in our opinion, one of the best cards ever made (#33 Pee Wee Reese turning a double play). However, it has been a long time since we put a complete 1953 Bowman baseball set. The set we just got in, which grades "Very Good", came from a local collector who was selling it on behalf of his father, who had a large collection of early 1950's cards from both Topps and Bowman. It is definitely one of the most consistent 1950's sets that we have ever had. This set does have one unique aspect: #114 Bob Feller is autographed. Bob Feller signed quite a bit of memorabilia during his lifetime, so we were not at all surprised to find that his card had been autographed. Although we have written an article about these cards in the past, this is one of the first times that we have had a full set. 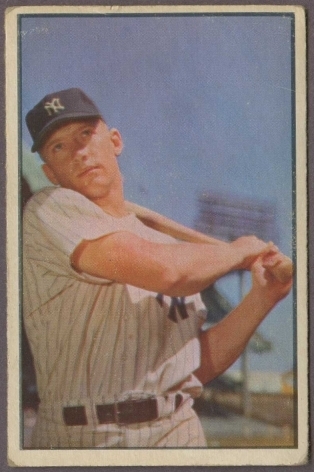 Click here to see Dean's 1953 Bowman baseball card article, which appeared in the October 15, 2010 issue of Sports Collector's Digest.